The cream of the Youth Grasstrack racing crop came together at Chelmsford to compete for the biggest title of their season, the British Youth Grasstrack Championships. A big crash by junior rider Archie Cale put a dramatic halt to proceedings, and due to the seriousness of his injuries the Air Ambulance was called and racing was understandably cancelled with the results being called after two blocks of racing for all classes apart from the Auto Cadets who raced before the Juniors. Dirt Hub wish Archie a speedy recovery and our best wishes to him and his family. On a tremendous circuit the Auto Cadet racers put on a fantastic show and it was reigning champion Cooper Rushen who was to take the title with a fantastic unbeaten performance ahead of Ollie Binns who finished 2nd and George Colvin in third. Ashton Vale stormed to the Cadet title showing some great speed to win both races, with Mitchell Bowmen second and Alfie Attoe a good third. In the Junior class Max Perry was the victor with double race win’s ahead of 2nd place finisher Cameron Taylor with Daniel Clark coming third. The oldest racers on show were in the Inter’s class and Jake Mulford showed pure class to take the title ahead Sam Norris in 2nd and the battling Micky Simpson in third. 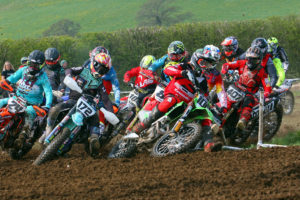 Huge Weekend of Grasstrack – Here’s whats happening!